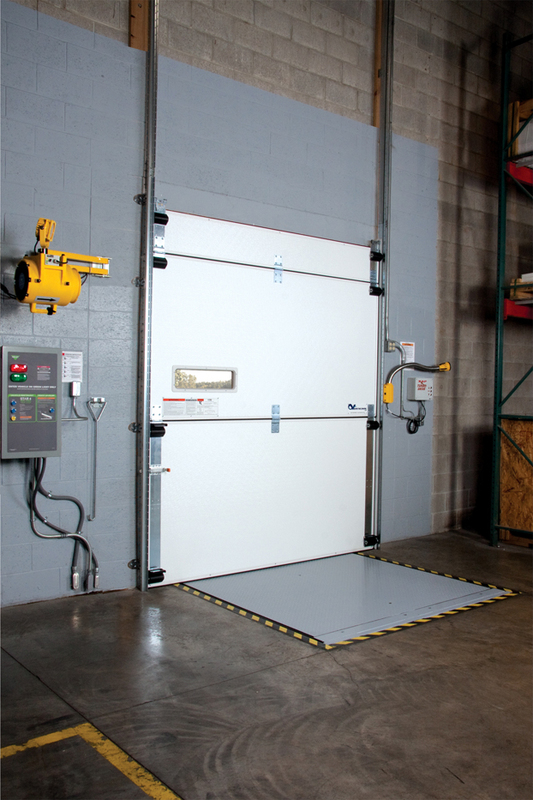 Pickerings Lifts’ Loading Systems, a division within the largest independent lift manufacturer in the UK, has announced plans to further bolster its offering to the temperature controlled market with the launch of VertiCool™, a leading impact resistant and energy efficient sectional vertical door. Launched as an alternative to the standard temperature controlled environment sectional door, VertiCool™ provides those working within the temperature controlled marketplace the opportunity to further improve energy efficiency and refrigeration cleanliness, whilst also reducing repair, maintenance and ownership costs. Specifically designed for use with dock levellers, the VertiCool™ dock door’s unique construction incorporates the latest in loading systems technology and material innovation with a polymer track system and utilises 1220mm high panels. 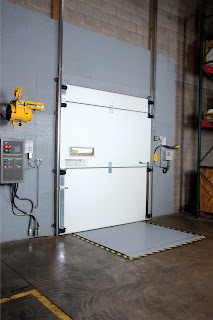 The new product offering from Pickering Lifts’ Loading Systems enables panel joints to be reduced by as much as 50 per cent when compared with standard sectional door tracks, while its construction provides a smooth surface for a tighter seal which both aids a reduction in conductive heat loss and moisture and debris build up. With the standard sectional door being prone to damage and increasing the need for subsequent repair work, the VertiCool™ has been created to reduce impact damage. This is possible through its closed cell foam interior, with dual compression side seals, dual overlapping header seal and compression loop bottom seals. When coupled with its UV-stabilised exterior painted aluminium skin, it makes VertiCool™ not only the most durable product available, but also the most effective. Commenting on the launch of the VertiCool™ dock door, Marcus Clissold, Business Development Manager of Pickerings Lifts’ Loading Systems says: “We pride ourselves on working closely with the industry to continue to deliver products and services which enhance it. From listening to those working within the cold storage sector we realised the great demand for a door that could not only eliminate energy loss and the hygiene issues found from using a standard product, but also reduce the cost for repair through unavoidable wear and tear. “From initial trials in the UK and those carried out extensively in America, maintenance crews noted a drastic reduction in running costs and an improvement in energy efficiency, which in turn posed significant benefits to overall operation. Demonstrating its commitment to the new product launch, Pickerings Lifts’ Loading Systems is offering a 30 day trial to customers interested in realising the benefits it VertiCool™ offers to their operations. For more information on VertiCool™ or any products and services offered by Pickering Lifts’ Loading Systems visit www.pickeringslifts.co.uk, email info@pickeringslifts.co.uk or call 01642 607161 to book a product consultation.